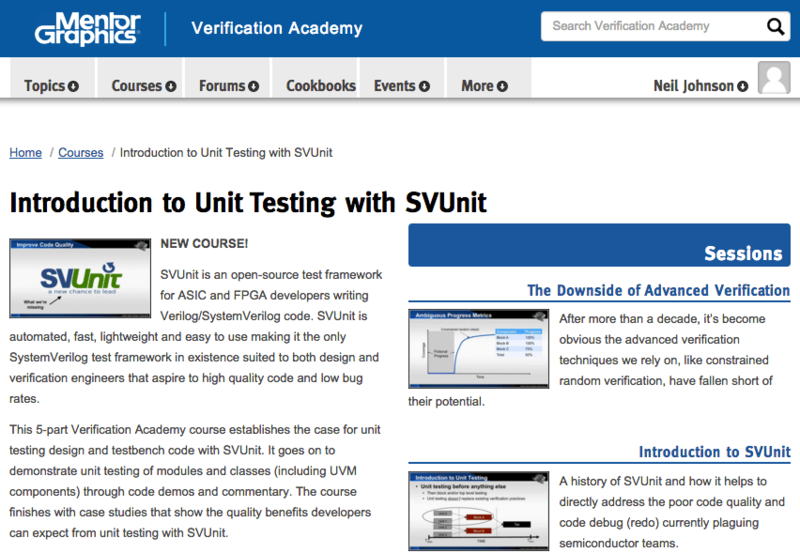 We’ve hit a notable day in SVUnit history today with an hour training course going live on Mentor’s Verification Academy. An Introduction to Unit Testing with SVUnit is a 5 part video course. It starts with my opinions on how advanced verification methods have failed to reach their potential, goes on to introduce SVUnit with a couple of coding examples and finishes with data from case studies that show the value of unit testing with SVUnit. Version 3.8 of SVUnit, just released, improves support and usability for people unit testing UVM components. Download the Latest Version of SVUnit from GitHubBut before we talk about new features, I want to mention that the cool part of this release… for me anyway… is that I didn’t have to do anything! Colleen Piercey and Dave Read, colleagues of mine from XtremeEDA, are responsible for adding and testing the version 3.8 features. That makes Colleen and Dave the newest active contributors to SVUnit! The inaugural SVUnit User Group Lunch will take place the week of DVCon in San Jose. Bringing SVUnit users together is something I’ve wanted to do for a while. So much so that I’ve held off using the word ‘inaugural’ for my entire life, saving it for exactly this moment! Details are still being worked out, but so far it’s looking like lunch time, Wednesday March 2, somewhere near the Doubletree Hotel in San Jose. It’ll be an informal gathering where developers that are either using, evaluating or thinking of using SVUnit can get together, get to know each other and share experience and opinions. We’ll have room for about a dozen people (happy to say I’ve got 3 confirmed already). This is an important community building exercise that I’m pretty excited about. With the SVUnit user base growing, now seems like the right time to start learning from each other. If you’re an SVUnit user and/or you want to meet other SVUnit users over lunch, please let me know at: neil.johnson@agilesoc.com. I’ll follow-up with details as they get sorted out.